Members enjoy a multitude of benefits. From our extensive Times database, to top tips and training advice, to the opportunity to enter the nation's most prestigious events. USA Swimming membership is a must for any competitive swimmer or coach. The Short Course Season is September through March (short course yard (SCY) competitions) - Annual Registration Fee: $100. Long Course is April through August (long course meter (LCM) competitions) - Summer Only Registration Fee: $75. Swim for a whole season or just month-to-month by sections according to membership dues. Discounts are available along with family discounts. An Outreach Program is availble or families needing assistance.. Annual registration fee must be paid with first month's dues. 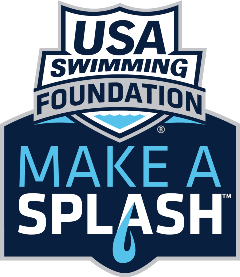 Annual members will receive a subscription to Splash magazine, a Club T-shirt (orders are placed in January and extras will be available throughout year), and a team cap (when swimmers compete in first USA swim meet). Members may participate at any practice site. During practice, the use of a 1-piece swim suit, swim cap for long hair, and goggles is mandatory. Members must attend as many practices as possible and any fundraisers. Participation in meets is optional but strongly encouraged at every level. Competitive age groups and senior swimmers must arrive 10mins early for practice ready for dry-land (T-shirt, shorts & sneakers with swim suit underneath) to stretch.﻿ All swimmers need a water bottle at every practice.